Heartland Theatre's production of "The Diviners," Jim Leonard Jr.'s "splendid Depression-era fable," opens this Thursday, September 8th. 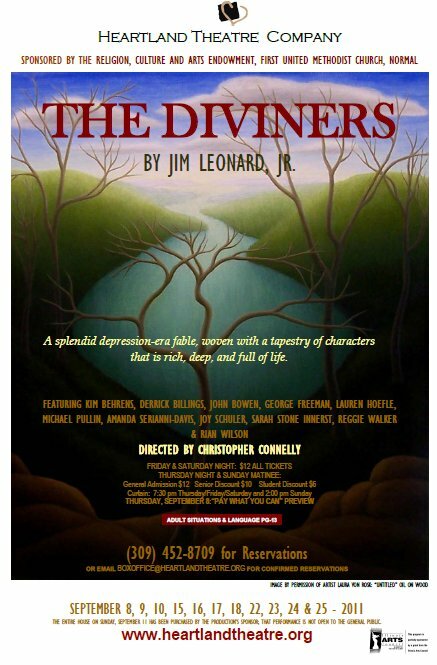 "The Diviners" is the second show of Heartland's ambitious new season, with the 10-minute plays back in June the first. After "Diviners," Heartland moves on to Deborah Zoe Laufer's "Sirens" in November, Theresa Rebeck's "Mauritius" in February, and Tracy Letts' "Superior Donuts" in April. "The Diviners" is billed as "a play in two acts and elegies," underlining the play's serious themes on the issues of religion, trust and personal faith, as a lapsed preacher named C.C. Showers arrives in a small Indiana town in the 1930s, coming up against townspeople's conflicting views on what faith really means. Several ladies in town see handsome, charismatic C.C. and immediately want him to take over as their town preacher, which he absolutely doesn't want to do. But C.C. 's most difficult problem arises with a boy named Buddy, who happens to be a first-rate "diviner," meaning he can find water even in times of drought. Buddy is also deathly afraid of water. And when C.C. arrives, Buddy is suffering from a terrible itch that only bathing in cool water can fix. The boy is afraid, C.C. is determined to help, and the townspeople and their fixed notions of who ought to act like what only make things worse. Leonard's play is poetic and engaging, raising lots of questions without necessarily providing the answers. It was written in 1980, when Leonard was still an undergrad, as an entry for Hanover College in the American College Theater Festival. Since then, the play has been well-produced throughout the country, as its down-home, unpretentious view of small-town life during the Depression has proved appealing to audiences, and C.C. 's and Buddy's struggle with what to believe in times of trouble never goes out of style. For Heartland, Christopher Connelly directs a cast that includes Kim Behrens, Derrick Billings, John Bowen, George Freeman, Lauren Hoefle, Michael Pullin, Amanda Serianni-Davis, Joy Schuler, Sarah Stone Innerst, Reggie Walker and Rian Wilson. Michael Pullin has designed the weathered wood set, with Tommy Nolan acting as lighting designer in this aggressively lit play. The Thursday, September 8 performance is a "Pay What You Can" preview, with no reservations accepted. Beginning Friday, September 9, tickets are $12 on Thursday, Friday, Saturday and Sunday, with discounts for seniors and students on Thursdays and Sundays. Curtain is at 7:30 pm Thursday, Friday and Saturday and 2 pm on Sunday. For those performances, reservations are strongly encouraged. "The Diviners" at Heartland Theatre Company is sponsored by the Religion, Culture and Arts Endowment of the First Methodist Church in Normal.